Few exercises stir up as much weight room bravado as the bench press — sometimes, it feels like "how much do you bench?" is the gym equivalent to "hi, what's your name?" But don't get too bent out of shape over numbers. As kinesiology professor Stuart Phillips tells The Chicago Tribune, "Consistent practice combined with good nutrition and practicing good form and working to fatigue — no matter what the load — is what makes up the majority of results." So while average figures can help you find a starting point or a barometer, it's essential to focus on the "your" when talking about your workout. As of 2016, the most recent data from the CDC's National Center for Health Statistics puts the average American woman's weight at 166.2 pounds, while the average male clocks in at 195.5 pounds. With that info in hand — or your own stats in mind — you can pop on over to the National Strength and Conditioning Association-approved ExRx.net's official Bench Press Standards chart. For a 198-pound man — a very close match for the national average — who has no experience benching whatsoever, ExRx places the standard at 135 pounds. That jumps up to 175 for a novice and 215 for an intermediate lifter. At the advanced level, the number is 290 pounds. Meanwhile, the standard for an untrained woman who weighs 165 pounds is a bench of 80 pounds, or 95 for a novice. For an intermediately experienced woman of average weight, the standard is 115 pounds, or 145 pounds for an advanced lifter. Though ExRx's chart serves as a handy rough guideline for fitness enthusiasts, newbies and trainers alike, knowing the average isn't the end-all, be-all. Going back to Phillips, his findings — originally published as a study in the Journal of Applied Physiology in 2012 and updated in 2016 — reveal that lifting three sets of weight at 30 percent of your one-rep maximum (the amount of weight you can lift, at most, for a single repetition) actually makes for more muscle gains than lifting at 80 percent of your maximum. "I think a lot of the variables in a resistance training program — rest, sets, loads and other variables — are largely redundant in their capacity to bring about strength and (bigger muscles). Get to the weight room, consistently practice, work to fatigue — this is 80 percent of the job." Do you find yourself pretty well aligned with widely accepted benching standards, or are you a proud outlier? 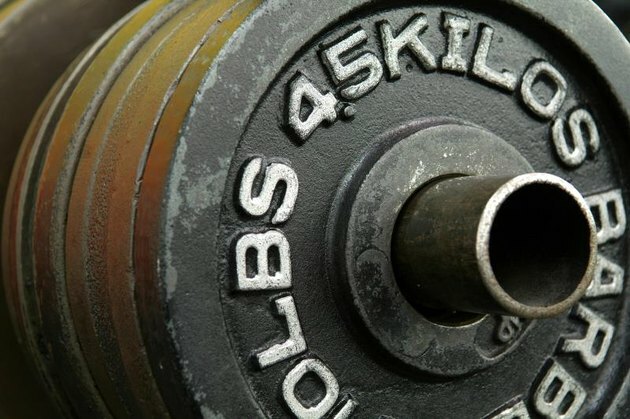 Are you a proponent of traditional "big lifts for gains, light weights for tone" school of thought, or has your experience corroborated the more recent findings? There's lots to talk about on this one, so let's talk it out together in the comments below. Chicago Tribune: Light Lifting, Big Muscles? Davey Wavey Fitness: How Much Should You Be Able to Bench Press? How Much Weight Can the Average Man Lift? What Percentage Should My Max Be in Weight Lifting?